This is Mum’s version of an African classic and it’s often called gravy. Full-flavoured and adaptable, it forms the basis of almost all our sauces and stews. 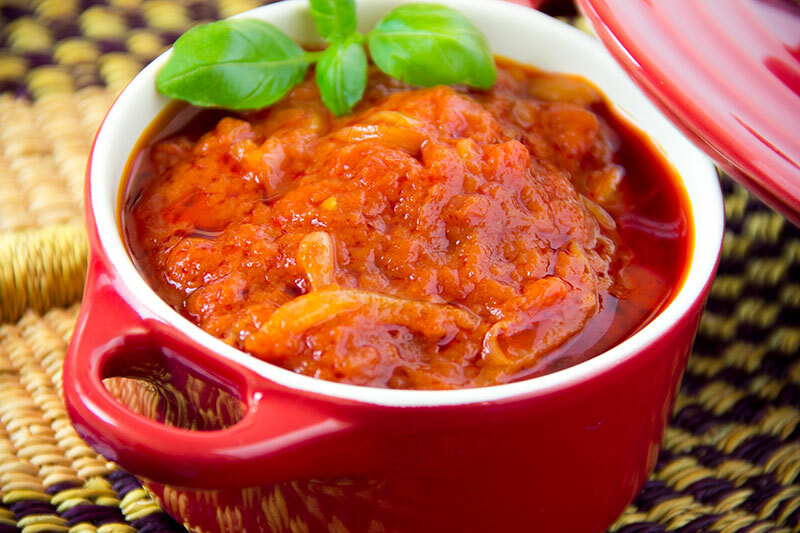 Simple to make, this spicy tomato sauce is an excellent base for seafood, meat and vegetarian dishes. As it cooks, it breaks down and thickens to form a partial puree. If you want a smoother sauce just give it a quick whizz with a blender – a good way to conceal wholesome ingredients from fussy eaters. I often prepare a large quantity and freeze in portions. Heat a heavy-based pan, add the oil, then fry and stir the onions until golden. Stir in the remaining ingredients and bring to the boil. Taste and adjust the seasoning. Leave to simmer until the sauce reduces and intensifies in flavour and the oil separates. This should take about 10-15 minutes. Remove the guinea peppers and ginger. Your sauce is ready and can be served hot or cold. Depending on the dish you are cooking you may let the sauce reduce in volume or add a little water to thin it. No Replies to "Maa's Tomato Sauce"